Welcome to my site! Please visit my gallery of handmade ceramics and let me know if you have questions or would like to make a purchase! Dinnerware and servingware sets from The White Collection will become available in November, 2017. If you’d like to place an order, you may text me at 205-540-6187 or shop at The Cook Store of Mountain Brook and Alabama Goods of Homewood, Alabama. Turn-around time for special orders is currently 4-6 weeks, depending on the size of the order. Enjoy browsing through the gallery and price list on this website to put your wish list together for the holidays! 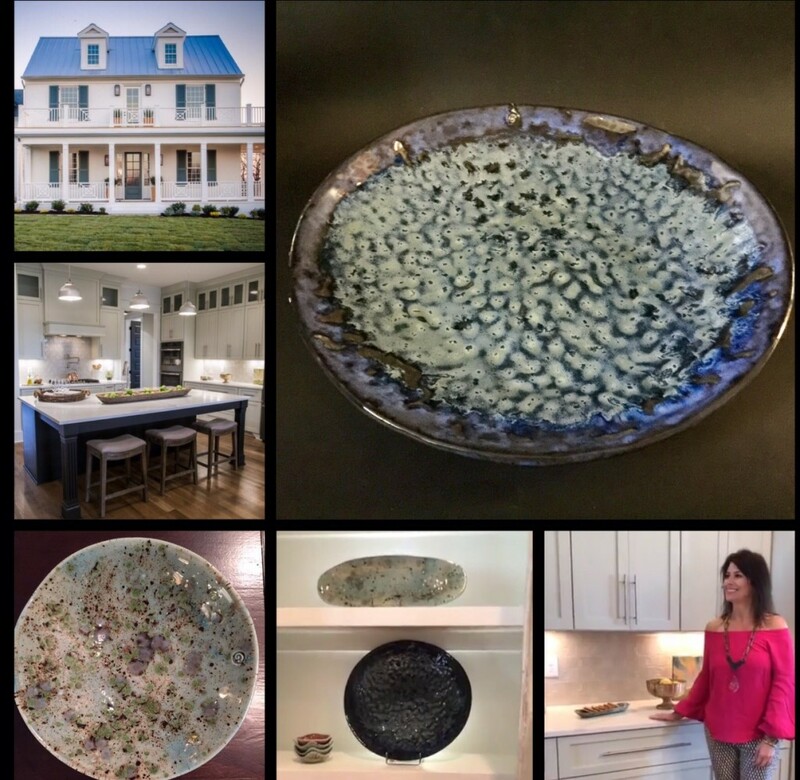 It was an honor to be chosen by Designer, Lucy Farmer from Lucy’s Inspired, to showcase Gidge Black Pottery at the House for Hope Children’s Charity in Franklin, TN in March, 2017! Aromatherapy pendants can be purchased with an adjustable leather strap to be worn around the neck ($25 for an Image of God necklace that comes with a card and cloth bag and $20 for all other necklaces). Just add a drop of essential oil to any porous, non-glazed spot on the pendant. 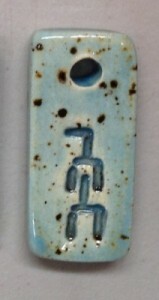 Some pendants have a shiny glaze surface on the front, in which case the oil would not be absorbed and would need to be dropped on the unglazed back of the pendant and allowed to absorb into the clay before wearing. You may also choose a pendant that is stained on the front, rather than glazed, in which case the oil can be dropped on either side. But in both cases, be sure to allow 1-2 minutes for the oil to absorb so that it stays in your pendant for you to enjoy throughout the day. (My favorite oil is Stress Away by Young Living but any essential oil can be used and switched out every day or two, though I would recommend waiting a few days between switching oils, due to the lingering fragrances of the previous oil used.) If you would like more information about purchasing and using essential oils, just send me a message through the sidebar and I’ll be glad to answer any questions! I’ll be adding more pendant styles over the next few weeks so be sure to check with me about the current selection! 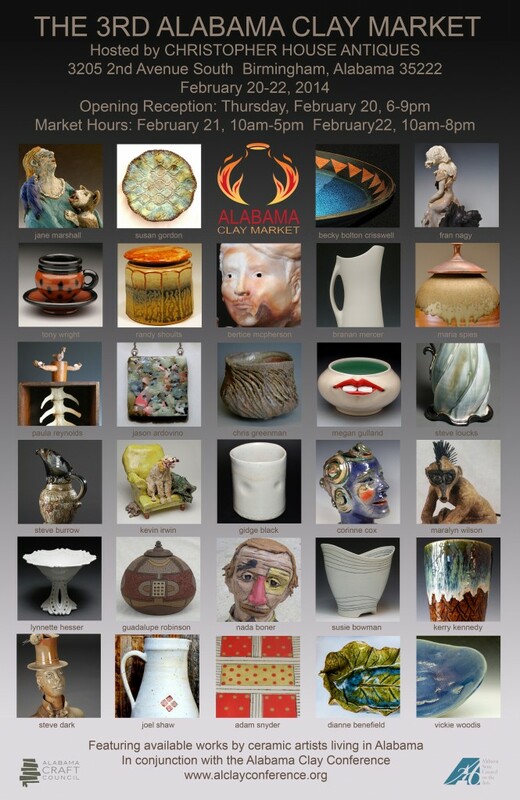 The 3rd Annual Alabama Clay Market was a success! 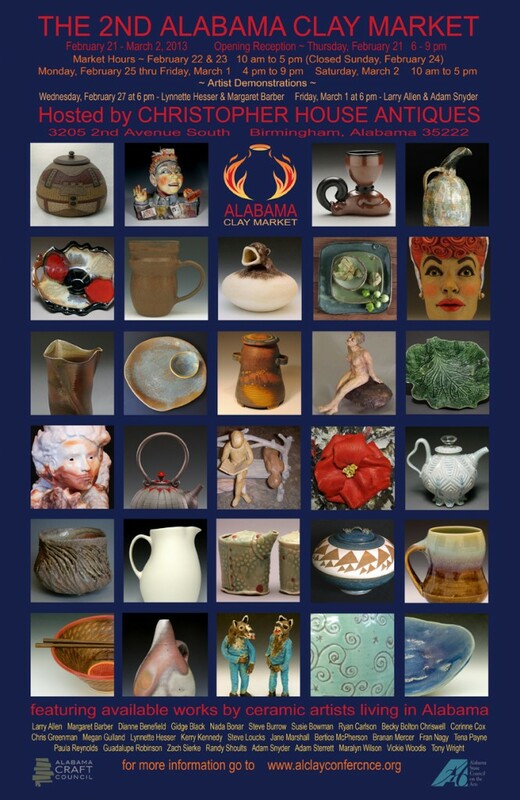 Please watch for upcoming shows where you can find Gidge Black Pottery. 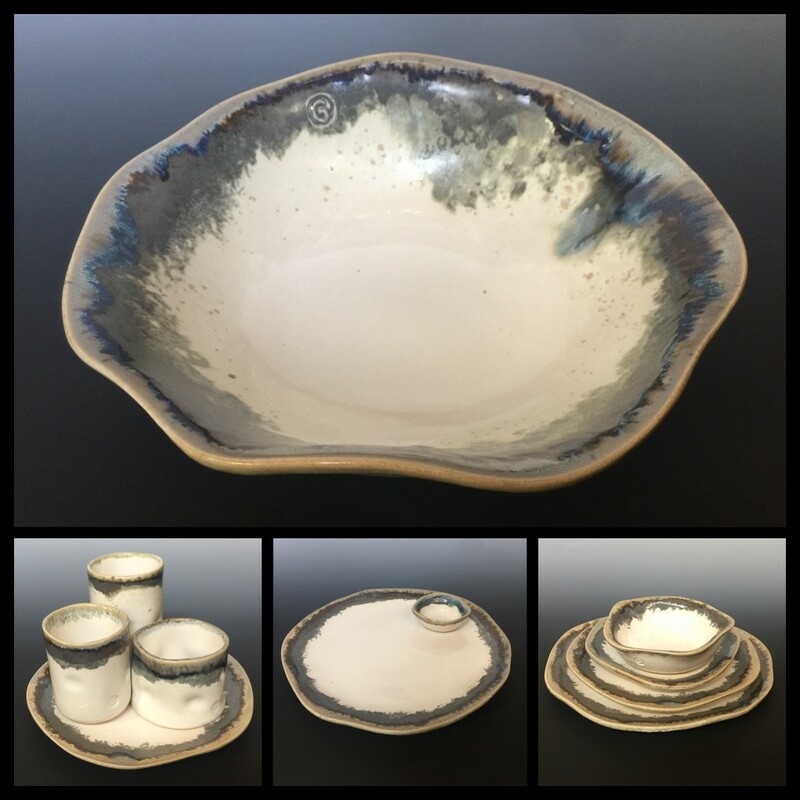 A 6 place setting of my dinnerware collection from The Cook Store will be on display and available for purchase at the Antiques at the Gardens Show at the Birmingham Botanical Gardens Oct 3-6, 2013. The pieces in this collection are glazed in Iron Saturate, Oyster Shell, Moss Green and Autumn Leaf. 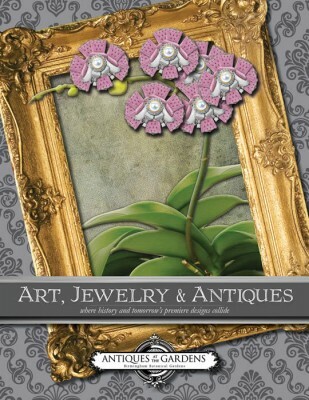 Antiques at the Garden features many artists from the region, as well as, architects, landscape designers and interior decorators. The hours are 1-5 Thursday, 10-5 Friday, 10-5 Saturday and 11-3 Sunday. Come shop and be inspired! These necklaces and key chains were inspired by my close friend who was diagnosed with breast cancer. Throughout her exhausting chemo treatments, she inspired those around her with her positive,fighting spirit (as did my Mother-In-Law who was also diagnosed and treated for this disease). Friends and family wanted to show our support and these necklaces provide a way for us to do that. Half the proceeds of the pink ribbon Hope necklaces go to breast cancer research at UAB. 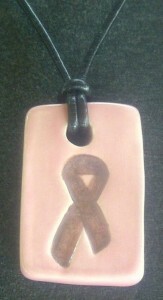 Any of the necklaces can be made-to-order in the color designated to a particular cancer type. With so many of our lives being affected by the disease of cancer, together we continue to fight for a cure! I was at a weekend Prayer Retreat when I experienced something so moving, I knew, immediately, that I would use my clay in an effort to share its impact with others. The speaker was well educated in world religions and passionate about human spirituality, as a whole. He shared with our group that when the Hebrew Name of God, YHVH, yod-hey-vav-hey, typically pronounced, “Yahweh,” is written vertically, it takes the shape of a human being. He then had each of us pair off to face one another and draw the Hebrew Name of God on each other’s bodies, from our foreheads, down to our feet. While we each drew these Hebrew letters on the body of our neighbor and had them drawn on our own, we did so very slowly and thoughtfully, while our guest speaker invited us to see ourselves as the Name of God, the Image of God. He also encouraged us to see others in this same way, no matter what their belief system or how kind or hurtful they may be to us.